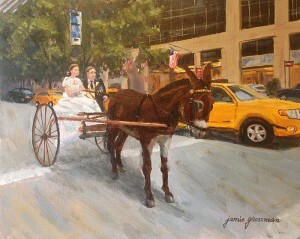 This commissioned New York City wedding scene was a surprise gift for the bride and groom from one of the guests at the wedding. Every once in awhile, an experiment takes place that makes me so happy I want to sing and dance. That’s what happened here. 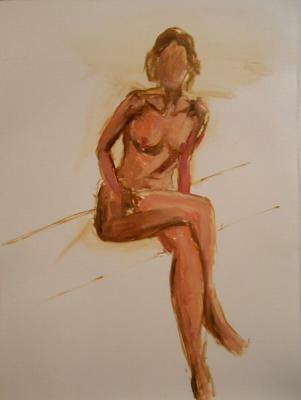 In preparation for a life drawing session, I decided to experiment last night with some of the Golden Interference Acrylics. I’ve been using them quite a bit for my surface preparation on dark supports, but I hadn’t actually tried painting with them. I am so happy with the way this turned out. 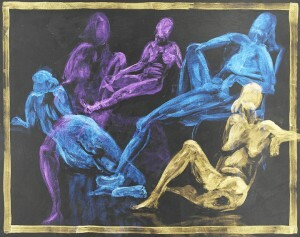 The figures almost seem to move as the light dances across the shimmery, metallic paint. I was initially sorry I didn’t have any sketchbook pages prepared with the Golden Black Gesso. However, given the way this turned out, that was actually a good thing. I had a 12×16″ spiral pad of black Mi Tientes paper. I’d even previously sized a page of it with Matte Medium, which I cut out of the pad (hence the reason why this montage is 12×15.5″ instead of 12×16″) It was ideal for this purpose. I worked from some photo references. That sure did make it easier in terms of selecting poses that would work in the piece. 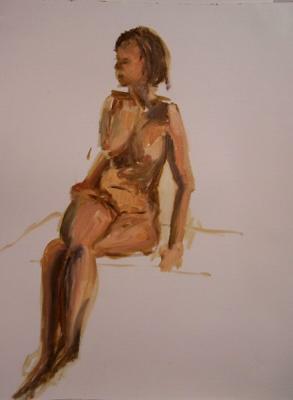 Since I always do these in open studio with a model, I am used to taking whatever pose the model gives the group, and trying to make that work within the composition. I can certainly see the benefit to doing some of these from photos for that reason, though I do prefer doing them from life. What I was trying to find out was whether or not I’d like painting with the interference paints on a dark ground. I have to say, I like it lots! I will definitely be doing some of these on my 16×20 boards too, now that I see the results on paper. Below is an image that you can click on to see a larger view of the painting. I might try to make a video of it later, so that you can see how it shimmers in the changing light. 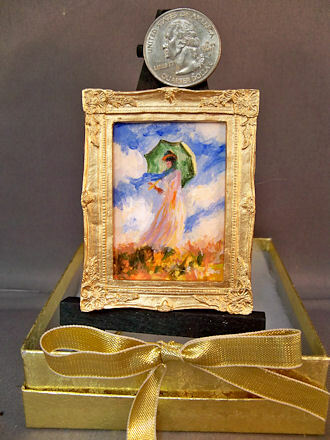 Here’s another of my tiny “Micro Master” paintings, this one after a Monet favorite. 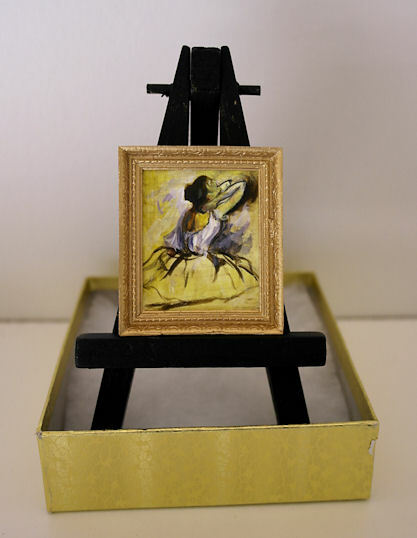 Figures are especially difficult in this diminutive size, but I love the challenge! The quarter in the photo is for size reference, so you can see how small these really are. These miniatures are so difficult and time consuming that I only do them on a commission basis. It’s a labor of love! 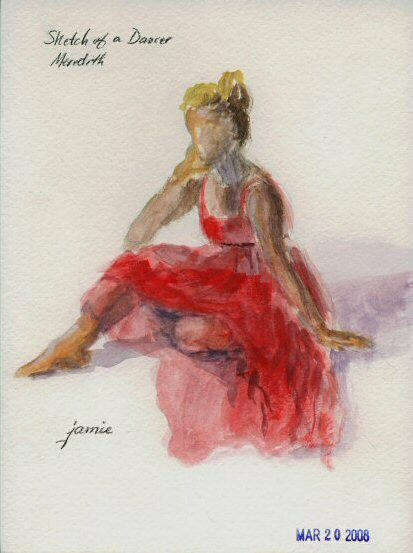 If you either have a favorite painting by a Master in mind or would like me to choose one for you as a commission, you can email me at JamieWG@aol.com. $425.00 plus $25 shipping and insurance within the Continental United States. For local sales, shipping charge will be allocated to NYS Sales Tax. Please email me at JamieWG@aol.com for International purchases or with any questions. I’ve spent a lot of time over the past couple of days looking at my photo references. 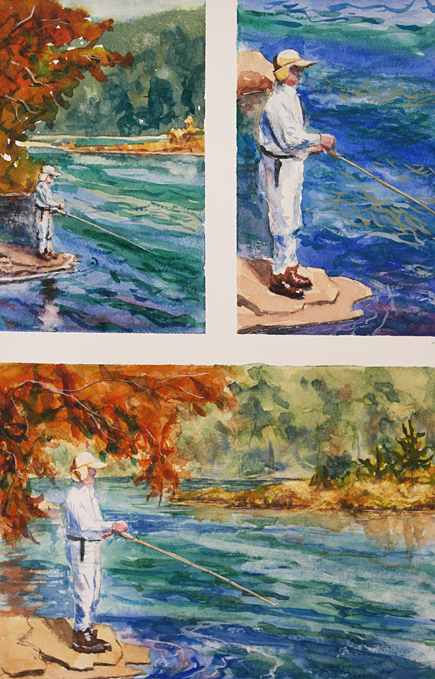 Usually I set aside photos that I take that appeal to me for paintings, and place those in a separate file. From time to time, I look back through ones I did not select, and usually find many that appeal to me now, though for some reason they did not grab me at the time. This photo is one that I took a couple of years ago, but happened to stumble upon it yesterday and saw it in a new light. 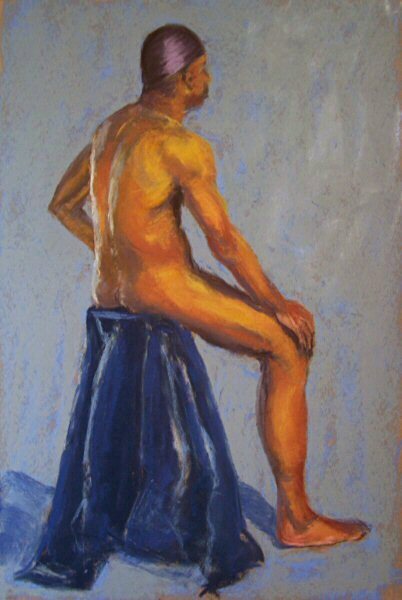 I did this painting with four of the new Golden OPEN colors: Prussian Blue Hue, Cadmium Yellow Dark, Transparent Yellow Iron Oxide, and Quinacridone Crimson, plus Titanium White. 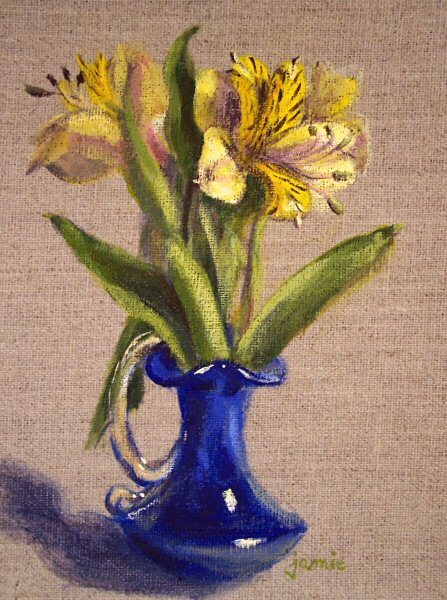 In the end, I also used a little Cadmium Yellow Primrose in the greens to increase the “sparkle factor”. I love these new colors! The Cadmium Yellow Dark mixes rich, warm greens. The Prussian Blue Hue is clean enough for skies, yet muted enough to not take over the painting, and mixes very deep darks (as I was hoping). The Quinacridone Crimson is going to become the new cool red on my palette. Transparent Yellow Oxide is a color I frequently use for underpainting and glazing in both oils and Golden Fluid Acrylics. I’m so glad that I have it now in OPEN as well! I still vividly remember this bright, late afternoon at the Vanderbilt Mansion property along the Hudson River in Hyde Park, New York. It’s one of the best sunset locations that I’ve ever encountered, and one of the few parks where you can drive right to the river (though they do close the road to the river on weekends). 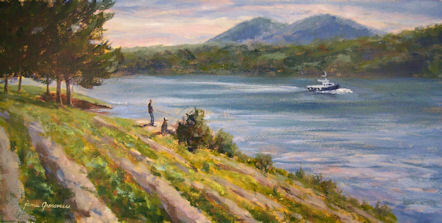 I haven’t done any plein air painting there for a long time, but I think I will change that soon! I haven’t done any pastel work for quite some time, so I decided to bring my large Dakota box of pastels to open studio this week.There’s everything under the sun in that box, all mixed together and sorted by value and color. This has been a tough week. My poor husband got food poisoning, and I hurt my back yesterday trying to move a cabinet, so my artwork may well be a little sporadic for the next week or so. I miss it already. The Secret Is Out! 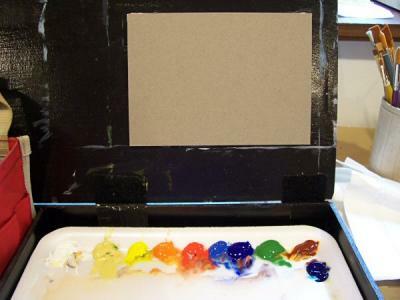 New Golden paints revealed…. Please email me if you are interested in this painting. It’s been sooooo hard for me to keep this under wraps, but the time has finally arrived when I can share the great news! Everybody’s been asking me this year what acrylic paints I’ve been using that look so much like my oils, and I have to hem and haw and politely change the subject……until now. Golden Paints has developed a brand new line of “acrylics” with a very long open time. It is called Golden Open. They’ll be shipping to stores on July 1. The painting above is one of my favorites done with these new paints. You can see my demonstration thread for this painting here.The underpainting was done with Golden Fluid Acrylics, and then the Open paints were used over that. I’ve been testing these paints for Golden Acrylics since last August, and it’s been such a thrill for me to finally have an acrylic paint that does what I want it to do. 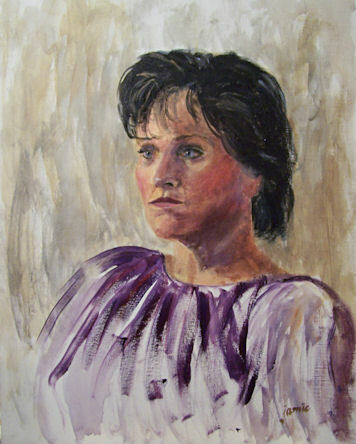 The long open time enables me to paint like I would with oils, only better. 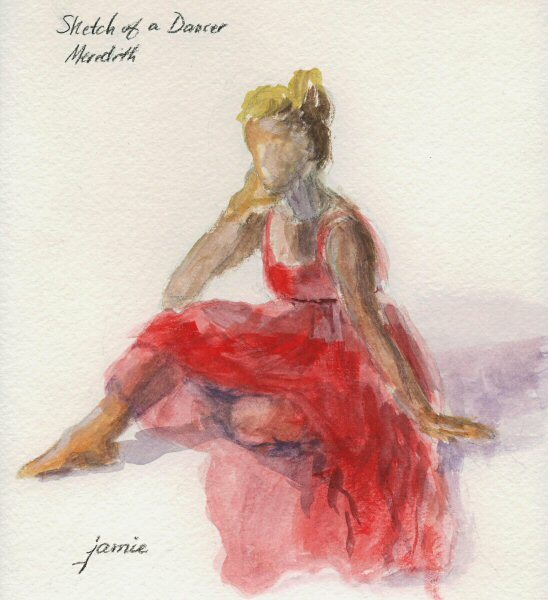 It is really like a new medium in that it can do some of the things oils can do, some of the things acrylics can do, some of the things gouache can do, and some of the things watercolors can do. 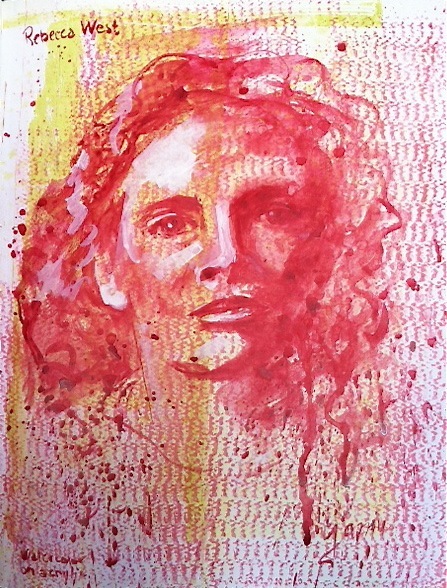 After nine months of using this paint, I feel like I’m still just scratching the surface in terms of its possibilities. Almost all of the acrylics that you’ve seen here on my blog since August were done with this paint. The paint tacks up as I work just enough to be able to do things that oils cannot. 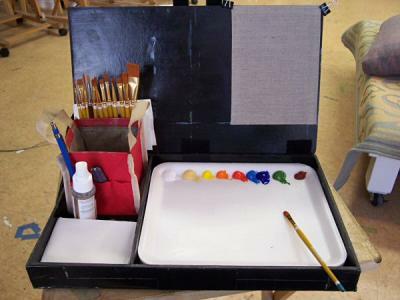 No more acrylic paint drying on your brushes either. When you finally get that mix of colors just right, the paint doesn’t dry out before you get a chance to use it. Edges can be blended and manipulated—no more razor-sharp acrylic edges in your paintngs unless you want them. Yet, it tacks up enough as I work to be able to scumble, glaze, and overpaint. Oils can’t do that! 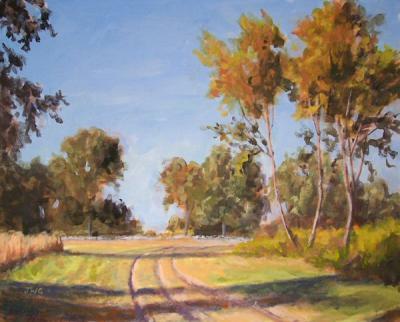 For plein air painting, they can’t be beat. Just a spray of water now and then keeps them totally workable. I can get paintings varnished and out to galleries in less than two weeks. I don’t have to put up with that nasty “sinking in” and flattening of values that oil paints do overnight without my permission! The color remains as beautiful and vibrant as when it was painted. These dry to a matte finish, so do not at all have that plastic look of many acrylics. I hope any of you artists out there reading this will have the opportunity to try out this new product. It’s like nothing you’ve ever experienced before. I’d be happy to answer any questions relating to the working properties of the paints; just enter them as comments on this post. I am so happy to be able to discuss them at last. I loved the way the backlighting rimmed the front of the figure in this pose. 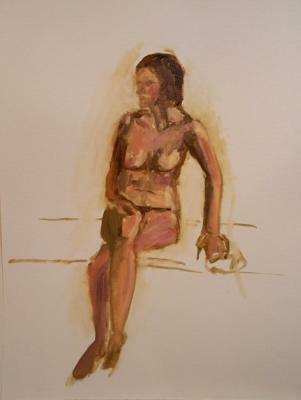 This painting is from today’s open studio—a great pose from our model Amanda, with lots of foreshortening to make me work extra hard! 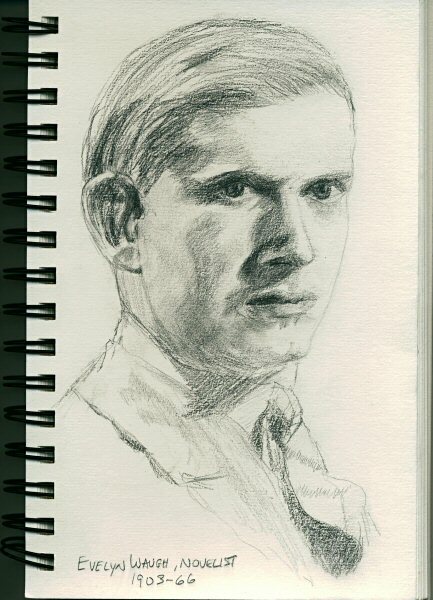 I try to sketch portraits and figures whenever I can. This one was done from a photo reference while my husband was watching the news last night. It is the novelist Evelyn Waugh. This is just for my own drawing practice and is not for sale. I like this Raffine sketchbook for water media very much, but I feel the texture is a little rough for graphite work. I went to Marshlands Conservancy in Rye yesterday. It was a gorgeous day and although I didn’t have time to stop and paint, I got loads of wonderful photo references. Now I have some compositional ideas for when I return there to paint later in the spring, as well as some things to work on during rainy days. This mom was having a lot of fun following her little boy around the beach on Long Island Sound. He went exploring every nook along the shoreline. It was a chilly, spring afternoon, but the bright sunlight made everything light up. I used an expanded palette for this painting. I think I actually dipped into every single color here. It’s unusual for me to use so many. This is from today’s open studio. 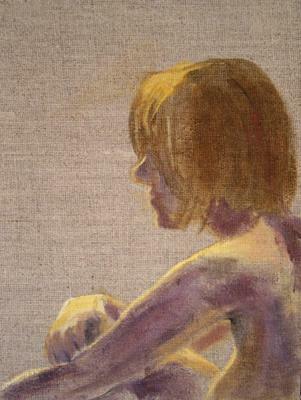 This is the first time I’ve done a figure on this clear-sealed linen, and I just love the way the colors work with it and the texture. I used the new, lightweight painting/pochade box that I made for this one. It’s working out great! Here it is in the life drawing studio all set up and ready to go…. 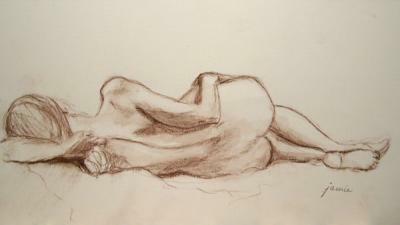 We had a wonderful model in the life drawing studio who is a dancer. I saw this beautiful red dancing skirt and immediately thought—Degas! I hope she’ll be back soon to model for us again. This is the first time I’ve used a scanned image of my artwork instead of a photograph. I think for small, completely dry work, and especially work on a white ground like this, it may be better to scan it. I can never get the white paper to show white when I photograph. 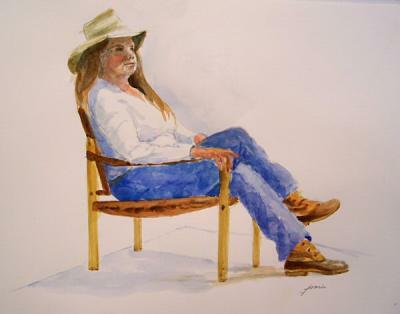 This sketch from life was done with an umber, water soluble Cretacolor stick on Arches hot press watercolor paper. It’s about 6×11″. 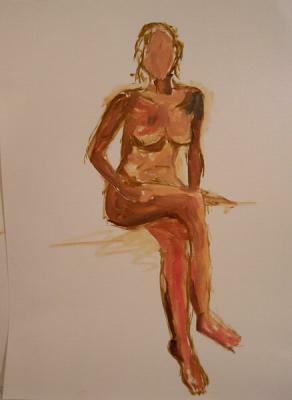 We had to leave our usual life drawing studio due to a solvent spill. 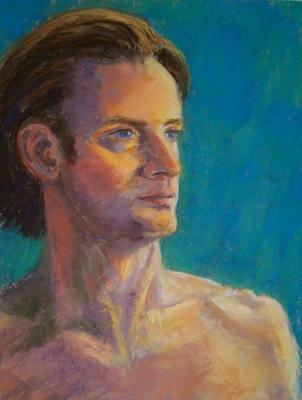 I was painting in oils, but when we moved to the clay room, there wasn’t room for my oil painting gear. 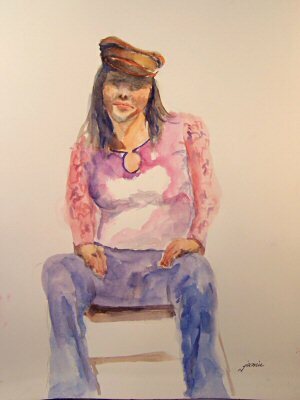 Fortunately, I had a little Winsor Newton Artist watercolor pan set in my purse and a nice umber Cretacolor stick, and some Arches paper in the car, so I pulled those out instead. You know what they say….When life throws you lemons, make lemonade! So, that’s what I did. We had our wonderful model, John, for one more session. I pulled out a 24×18″ piece of canvas and did the painting in one fell swoop. It was about an hour and a half of painting time. I love painting this way—trying to catch the essence of a pose, and seeing how refined I can get it, in a single sitting. It makes me think of plein air painting, where the moving light sets the clock constantly ticking, and you need to be able to say what it is you want to say without fuss and deliberation. Kerri was back modeling for us again today. I was going to do a bunch of quick oil sketches of her, but I really liked the way this was coming along, so I decided to stick with it for the full session. 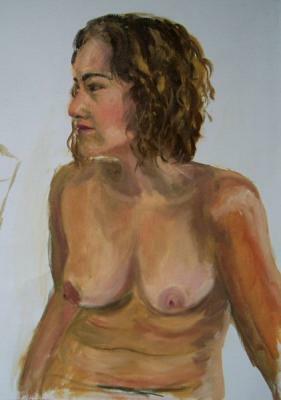 This was painted in two sittings from life. I may make some minor adjustments next week, but it is basically finished. I had a wonderful time playing with the warm and cool colors. There was a warm floodlight on, but also cool blue light from outside streaming in through the windows. The combination of light types made for some interesting challenges and color combinations. 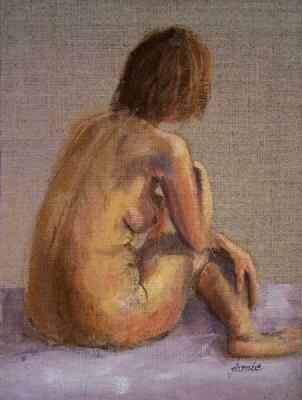 This is a fairly large oil sketch on canvas, painted from life this morning. It can be shipped when dry, rolled in a mailing tube. 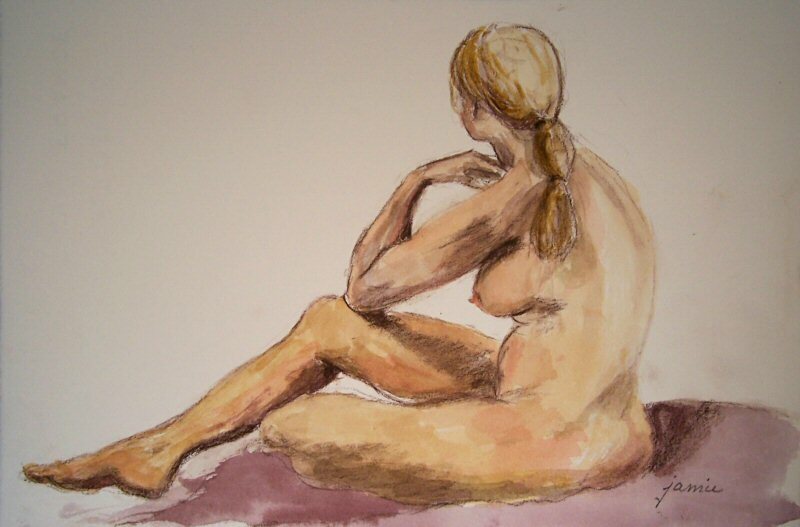 Nudes are wonderful paintings for bedrooms and private sitting rooms, and convey a feeling of intimacy. 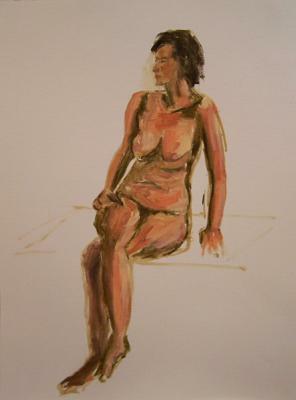 I really enjoyed working this size today in the life drawing studio. I cut a bunch of canvas pieces this size from a large roll I have, and I think I’ll stick with these larger ones for awhile. 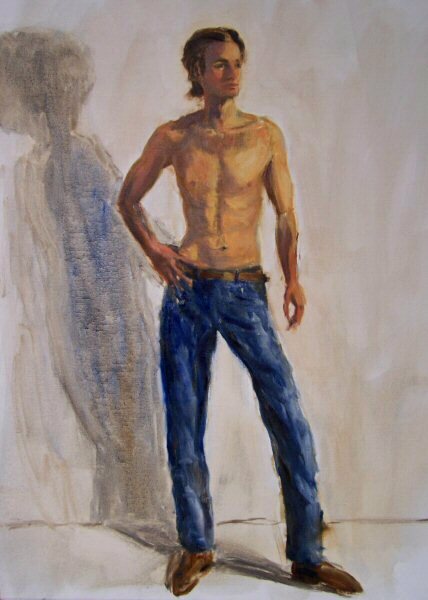 When I draw with charcoal in open studio, I usually go 24×36″, so although lately I’ve been painting figures a lot smaller, the 18×24″ size didn’t feel overwhelming. The longest poses in these Wednesday sessions are 50 minutes, so the real challenge is to try to capture something special in that period of time. 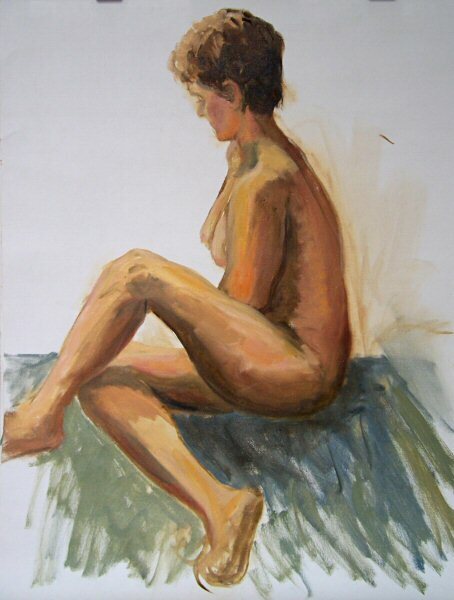 Everybody usually draws rather than paints because the time is so short. 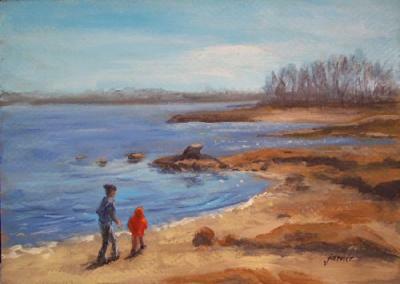 A couple of my oil sketches this morning bit the dust, so to speak, but I really like the way this one turned out. If I can come back from a session of short poses with just one thing I like, I consider it a success! 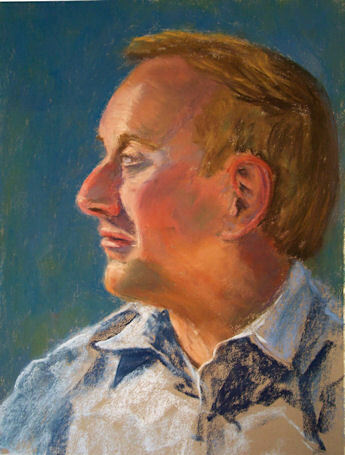 Yesterday, portrait artist extraordinaire Alan Reingold showed me how he teaches his Parsons students to speed paint figures in oils in 20 minutes from life. It was way fun! Each of these is a 20 minute pose, in order from the first of the afternoon to the last. I painted a couple and then moved my spot. The model kept the same pose. The paintings are 12×16″ each, though I’ll be moving up to 16×20″ as soon as I cut some canvas! They are on unstretched canvas. 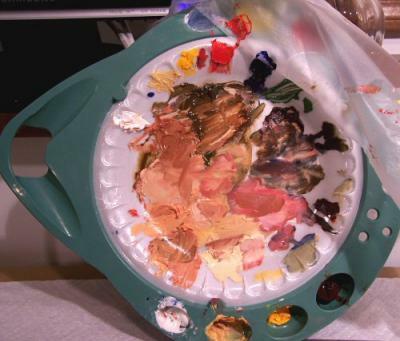 Here’s a look at the palette I used when all was said and done. I premixed a few colors to start, and adjusted with the colors on my palette as needed.